Despite the massive anti-narcotics drives, Rohingya citizens are still getting involved in deadly drug “Yaba” smuggling into Bangladesh from neighbouring Myanmar, detective sources have said. The Myanmar security forces are allegedly helping the Rohingya drug smugglers to run their business. On Saturday, police recovered the bullet-ridden bodies of two Rohingya camp residents in Cox’s Bazar. The striking team also recovered nearly 50,000 yaba tablets from the scene. According to Border Guard Bangladesh, they fired on two suspected intruders early Saturday, and added that they could not confirm whether anyone was killed in the shooting. The two bodies were found next to the Moinuddin Memorial College in Huila Union at around 8am yesterday, said Teknaf Police OC Pradeep Kumar Das. The new government has adopted a “zero tolerance” policy against drug smugglers, and law enforcers are up and continuing their drive against drug. Due to the recently held national election, law enforcers were busy ensuring peaceful environment as a result of which there was a lull in anti-narcotics drive. Taking this advantage, many listed drug traders who went into hiding in the face of massive drive reportedly resurfaced. Police said after their intensified drive, they have again gone into hiding. Recently, the lawmen arrested a listed drug trader Shahid Rana, alias Tipu, also chairman of local Charbagdanga union of Chapainawabganj district. Tipu was campaigning in favour of a candidate vying for the parliamentary election. Besides, at least 8 suspected drug traders were killed in separate encounters with law enforcers in different parts of the country including Feni, Kumilla, Meherpur and Cox’s bazaar last week. More than 300 suspected drug traders were killed in separate encounters with law enforcers across the country since the countrywide anti-narcotic drives began on May last year. Detective sources said though the Myanmar security forces are responsible for Muslim Rohynga persecution, mass killing, arson attack and dislodging them from their homeland, they are allegedly helping a section of Rohyanga drug smugglers to run their immoral business. The extent of yaba smuggling is so deep rooted that it is now threatening to destroy the lives of millions of youths in the country. In Teknaf along the border with Myanmar, the trade has lured several hundred poor Bangladeshis as well as desperate Rohingya refugees, risking their lives. The yaba route stretches along hundreds of kilometres away from Teknaf into the eastern part of Myanmar borders with China, Thailand and Laos. Sources said at least 45 yaba factories are operating in the Shan State border area of Thailand and Laos. 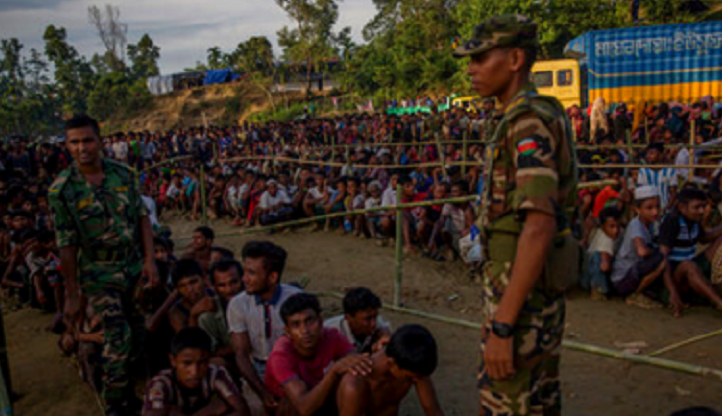 A section of the poor Rohingyas are used by the Myanmar security forces to transport the drugs to Bangladesh, and many of them make a good deal of money working as transporters. Under the protection by a section of Myanmar security forces, a section of poor Rohyangas continue smuggling a huge number of yaba tablets into Bangladesh through different water and land borders of neighbouring Teknaf upazila in Cox’s bazaar. Law enforcers have seized over 15.50 lakh Yaba pills and arrested nine Rohingyas in the last one month. Smugglers are cashing in on the Rohingya influx and smuggling the drug dodging the eyes of law enforcers, detective sources said. The smugglers of both countries have become active and started Yaba smuggling in the guise of Rohingya refugees. As law enforcement agencies remain vigilant, they arrested nine Rohingyas with 15,54,632 pieces of Yaba tablets worth Tk 46.63 crore over the last one month. If Yaba smuggling is not controlled immediately, the deadly drug will spread across the country in a large scale, they feared. According to the Drug Control Directorate, the smuggling of yaba suddenly went into a lull shortly after the Rohinga genocide on August 25 last year. Then it was supposed that the yaba smuggling decreased due to Rohynga cleansing, but suddenly it went up. At least 15 consignments of such yaba tablets were seized in Chittagong and Cox’s bazaar. At the same time, 26 drug smugglers, many of which were Rohyangas were also caught red handed by the law enforcers. As per their confessions, the drug control officials and law enforcers came to know that a section of the Rohingas are still staying inside the Rakhaine state in Myanmar under the direct protection by a section of Myanmar security forces who use the vulnerable groups to smuggle drugs into Bangladesh.